Measure for sideroom: 3-3/4" is required on each side for installation of the vertical track for standard extension or torsion springs. 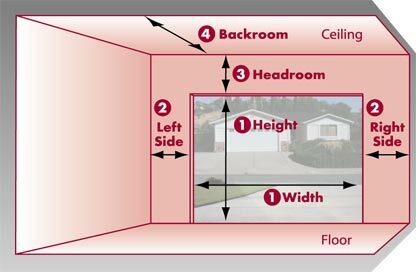 Measure area labeled "headroom"—distance between the top of the door opening ("jamb header") and the ceiling (or floor joist). 10" is required for standard installation of extension springs, 12" on standard torsion springs. 14" of headroom required for Carriage House doors. If you have restricted headroom, special hardware is available. Low headroom hardware is available to reduce requirement to as low as 4-1/2". Note: If door height extends above the opening, the headroom measurement should be adjusted accordingly. Measure area labeled "backroom". Distance is measured from the garage door opening toward the back wall of the garage. Common garage door sizes include 8' wide x 7' high, 9' wide x 7' high and 16' wide x 7' high. Omega Door provides most doors in nearly any size you require.